Pierogi are a dish consisting of boiled or baked dumplings of unleavened dough stuffed with varying ingredients. They are usually semicircular, but are square in some cuisines. Left: A plateful of Ruskie pierogi topped with fried onions. The origins of pierogi are difficult to trace. While dumplings as such are found throughout Eurasia, the specific name pierogi shows the name's common Slavic origins, predating the modern nation states and their standardized languages. In most of these languages the word means pie. Pierogi or vareniki are half circular dumplings of unleavened dough, stuffed (singularly or in various combinations) with mashed potatoes, cheese, cabbage, sauerkraut, meat, mushrooms, or other ingredients depending on the cook's personal preferences. Dessert versions of the dumpling can be stuffed with a fresh fruit filling, such as cherry, strawberry, raspberry, blueberry, peach, plum, or apple; stoned prunes are sometimes used. 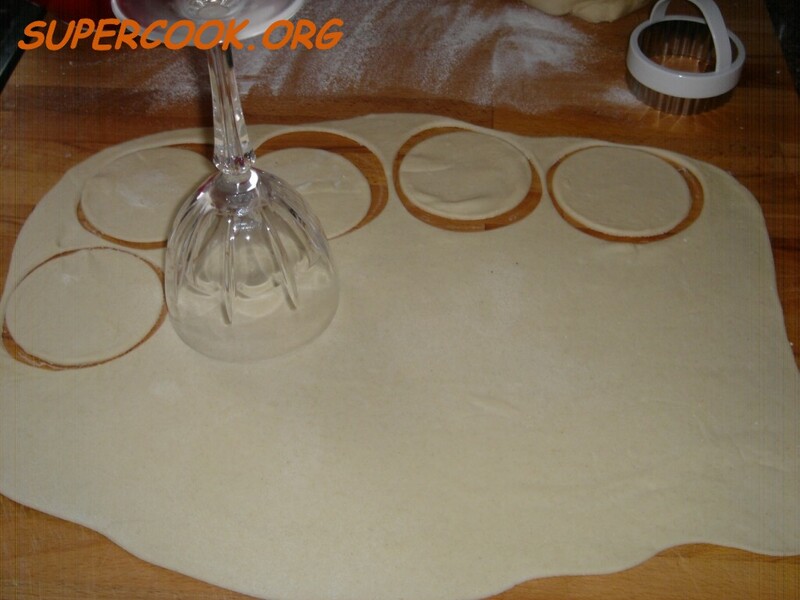 To prepare pierogi, the dough is rolled flat and then cut into circles using a cup or drinking glass. The filling is placed in the middle and the dough folded over to form a half circle. The pierogi or vareniki are boiled until they float, drained, and sometimes fried or baked in butter before serving. Left: Cutting the dough by using a wine glass. They can be served with melted butter, sour cream, or garnished with small pieces of fried bacon, onions, and also mushrooms. Dessert varieties may be topped with apple sauce. Some Polish families in North America serve them with maple syrup. Pierogi play an important role in Polish cuisine. 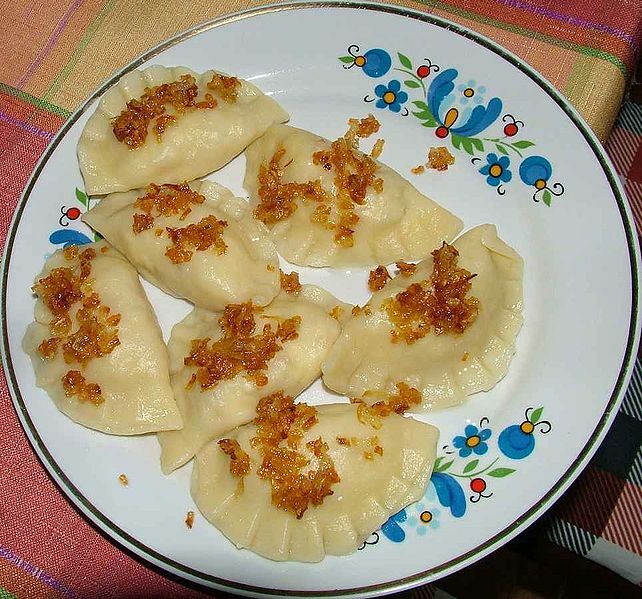 Polish pierogi are often filled with fresh white cheese (curd), potatoes, and fried onions; in this form, they are called pierogi ruskie (Rusyn or Ruthenian pierogi), which is the most popular variety in North America. In Poland more popular are pierogi filled with ground meat, mushrooms and cabbage, or for dessert an assortment of fruits (various berries, with either strawberries or blueberries being most common). Pierogi are usually served with melted butter and sugar, or melted butter and bacon bits. In Russian cuisine, the closest analogue to pierogi are vareniki. Pelmeni, which are meat filled, are also similar. The Jewish Ashkenazi version is called pirogen, which are usually boiled and fried before serving. A related Jewish dish are the kreplach, which are ring shaped dumplings (which look like tortellini) boiled and served as a side dish or in clear soup. In East Asia, similar foods are served, such as Chinese wonton and jiaozi, Japanese gyoza, Mongolian buuz, Nepalese/Tibetan momo, Afghani mantu, and Korean mandu. In Turkey, Transcaucasus, and Central Asia round pockets of dough with a meat filling are called manti, khinkali, or chuchvara (Uzbek dumpling). There is also a definite similarity to Italian ravioli.